That gives us 7 states that, when using the chart below, tell us quite a bit about the Sanders campaign strategy. Now that the primaries/caucuses are coming more quickly, they are having to prioritize. While not all of the 7 states are included, it becomes clear why Sanders performed so well in Iowa and New Hampshire as well as why he would do very well in Vermont – even if it wasn’t his home state. All three of them top the charts with the number of both liberal and white Democratic voters. The next phase for the Sanders campaign means moving in to states where he has less of an advantage in one or both of those areas. It is clear that the campaign has placed their bets on doing better with less liberal voters than with less white voters. While they are spending a token amount of money in Texas, it clearly isn’t a high priority state. Massachusetts is the next best state to IA, NH and VT, so Sanders has a chance to do reasonably well there – as he does in my home state of Minnesota. 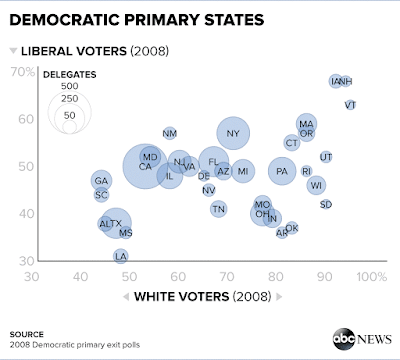 But beyond that, he seems to be focusing his efforts on states that are less liberal – but are still around 80% white. Since each state in the primary process allocates its delegates to the convention proportionally, the Sanders camp figures, he’ll walk away from South Carolina with some delegates, no matter what. And, recognizing that the Vermont senator does better when he can spend serious time in states, aides think as long as he can claim enough delegates between March 1 and 15 from the ones he’s now visiting, he can remain neck-and-neck with Clinton through the month. That’s a huge head start for Clinton, and it means Sanders would need to win roughly 55 percent of the 4,295 remaining pledged delegates and uncommitted superdelegates to reach a bare majority, while Clinton would only need to win 45 percent. That’s an extremely tall order, and so far Sanders hasn’t kept pace. 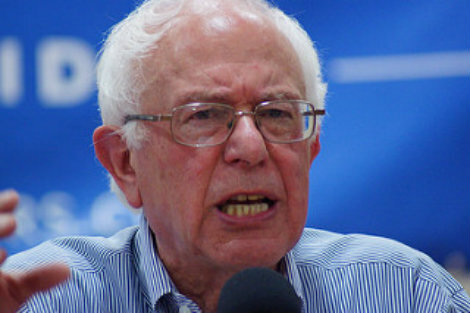 The Sanders campaign and his supporters can complain all they want about superdelegates, but those have been the rules of the game for a long time now and his dissing of the “establishment” has consequences. But even more important than Wasserman’s analysis, a Sanders strategy that tries to run up the score of delegates by focusing on states with more white Democratic voters avoids the question he eventually has to face: if his campaign can’t win over voters of color, he can’t win the nomination. On that score, his prospects look pretty grim right now.